Click here for a nationwide list of 100's of professional fox trappers serving all 50 states. FOX NUISANCE CONCERNS: Foxes are somewhat of scavengers and will therefore eat whatever they can find. They dig in gardens and under homes as well as eating pet food and other leftover garbage that has been left out unsecured. They may attack small pets on occasion. Their loud yelling/screeching can be annoying for residents living close by. They sometimes prey on chicken coops. They also sometimes den under human structures, such as a deck, shed, porch, or crawlspace, and have their pups. Other than that, they're relatively harmless. They're mostly shy and secretive animals. 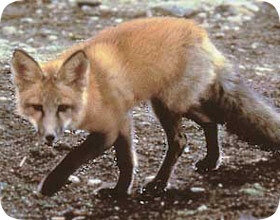 FOX DISEASES: Foxes are carriers of rabies. They are carriers of the tape worm parasite which can be transmitted to humans and take up residence in the intestines. They can also cause Sarcoptic Mange which results in the development of rashes in humans. HOW DO I GET RID OF FOX & COYOTES? There are several techniques from prevention to scare tactics, as seen on how to get rid of a fox, but the best method is trapping and removal. Many wildlife control specialists excel at canine trapping. In many areas, it's a lost art, since not as many people fur trap as in ye olde days. However, many nuisance trappers have learned to adopt the fur trappers' techniques in order to catch these animals. Some wildlife operators are in fact former (or even current) fur trappers. There are many techniques, some of which I consider inhumane, and some of which are antiquated. 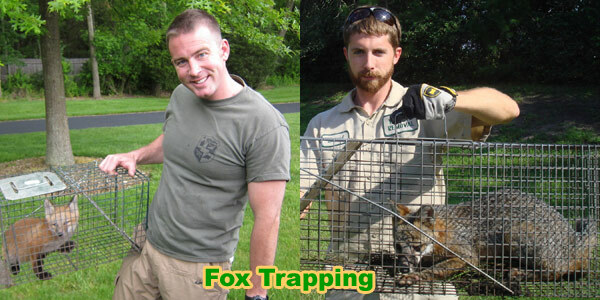 For more information about trapping, read my how to trap a fox - trapping tips page. CAN'T I JUST USE A REPELLENT? There is no known effective repellent to keep fox off of a property, but there are steps you can take to keep foxes away. Read my fox repellent and prevention page for more info. FOX BIOLOGY: The Red Fox (Vulpes vulpes)is a fairly small wild canine. It can vary in color, from orange to gray to silver or black. Foxes are omnivorous (eating both plant and animal) animals having a brushy tail and a long narrow snout. There are a total of 37 species of foxes with a natural life of about 10 years for almost all of them. They have a smaller build when compared to domestic dogs, wolves and jackals. The male foxes, known as Reynards, weigh around 13lbs while the female foxes – or Vixens - weigh around 11.5lbs. A male fox can be around 26 to 29 inches in length with a tail length of 16 to 18 inches while a female fox can be around 24 to 27 inches in length with a tail length of 14 to 18 inches. FOX BEHAVIOR: An interesting thing to note here is that there are different characteristics of foxes based on the environment they are living in. A fox living in a desert area has large ears and short fur while a fox living in snowy areas has tiny ears and thicker fur for protection against the harsher elements. Foxes live in small families and hunt rodents for their food. They also like consuming grasshoppers and fruits. The grey fox species can actually climb trees. Foxes also tend to hide and store their food to help get them through times when food sources are not as readily available. Foxes are not friendly with humans; however, they do not confront or attack humans either. In fact, there have been only a handful of cases where a fox has attacked a human being; and those may have been because of feeling threatened or frightened. Read my are fox dangerous to people or pets? page for more info. They can run at a speed of up to 42 miles per hour and have an acute sense of sight, smell and hearing. Like many other creatures, they prefer to hunt at night and stay in their dens during the daylight hours. FOX HABITAT: Foxes generally make more than one den to serve different purposes. The main den, which has several entrance and exit areas, is used primarily for breeding. The smaller dens usually have only one entry or exit point and have a long tunnel stretching over 30 feet that connects it to the other dens. Although capable of digging burrows, they usually prefer to make their homes in burrows and dens made and abandoned by other animals. As such, they will often live in or under human-built structures. If this is the case for you, read my fox under a shed, deck, or house page. FOX LIFE CYCLE: The life cycle patterns of foxes differ from the northern hemisphere to the southern hemisphere. For the northern hemisphere foxes, the female gives birth to four to five pups during the spring. The babies are deaf and blind at birth with a coat of fur for insulation. The mother fox stays with them while the father hunts and gathers the food. The cubs start coming out of the den after they are at least four weeks old. It is around this time that they start consuming solid food as well. During the summer, the parents abandon the breeding den and the cubs are taught the skills to gather food. By the time autumn comes, the pups have grown up to full adults and start their own separate life. By the winter season, the young adult foxes are ready to mate.